Lincoln Park Community Services hopes to buy the former Culinablu site at 1521 N. Sedgwick St. and open a homeless shelter there, but some residents are opposed. OLD TOWN — Residents near the CTA Sedgwick "L" stop said opposition is growing to a proposed homeless shelter across the street from the station. "There's very strong resistance to it," Mitch Newman, one of the organizers of Old Town Neighbor's Vote, said Tuesday. "Probably, of the people we talked to, 9-to-1 against it." Newman said residents were blindsided by a community meeting earlier this month that was promoted as being about a "transit-oriented development" without mentioning the purpose of the proposal. 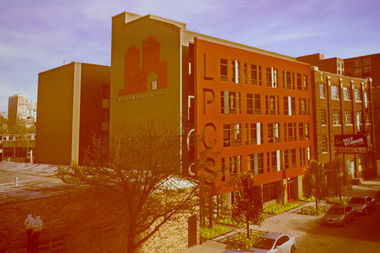 Lincoln Park Community Services, a homeless agency now in the basement of Lincoln Park Presbyterian Church at 600 W. Fullerton Parkway, wants to expand to Old Town by buying the former Culinablu Living Kitchens building at 1521 N. Sedgwick St. and converting it to 20 permanent residences and 48 temporary rooms for the homeless, along with agency offices. The proposed Lincoln Park Community Services site in Old Town would have 20 permanent residences and 48 other temporary units for the homeless. It needs a zoning change on the property to qualify for benefits as a transit-oriented development, which would allow it to offer far fewer parking spaces than the city normally requires for a building of its size. The proposal met little resistance at the meeting, held in the Catherine Cook School gymnasium at 226 W. Schiller St., because, Newman said, local residents didn't really know what it was about and didn't attend. "People are very upset," Newman said. "It never said the word 'shelter.' It never mentioned Lincoln Park Community Services. "We don't feel that it had a real public discussion or a fair public hearing," he added. He said Old Town Neighbor's Vote has collected more than 100 signatures on a petition opposed to the project since last week, circulated primarily among residents on Sedgwick, Orleans Street and Hudson Avenue south of North Avenue. On Thursday, Newman said the group had now collected 232 signatures on the petition, adding that Ald. Brian Hopkins (2nd), whose ward extends into Old Town, had come out against the measure. Saying that he lives near Deborah's Place, a women's homeless shelter down the street at 1530 N. Sedgwick, Newman insisted this was not a case of "not in my backyard" thinking. Rather, he said, it's "not the fifth time in my backyard," and he charged the city is hurting the area by concentrating various forms of subsidized housing there. Sedgwick Street resident Christian Beck agreed in a letter he sent to 27th Ward Ald. Walter Burnett and shared with DNAinfo. "While the mission of Lincoln Park Community Services is a noble one, it is inappropriate for more transitional and subsidized living outside of Chicago’s Affordable Housing Ordinance to be located in this area," Beck wrote. There are already 150 beds for the homeless between Deborah's Place and the Margot & Harold Schift Residences, and almost 1,000 subsidized Section 8 housing units among the Marshall Field Garden Apartments, Evergreen Terrace Apartments, Evergreen Tower and North Park Tower, Beck said. "Allowing the zoning change would be a mistake," Beck added. "It is inappropriate and unfair to allow one distinct area of the city to have such a high concentration of institutional living. It would undoubtedly impact the positive changes occurring in the neighborhood." Burnett, though, said the opponents were "just concerned with their property values." "What if the low-income people say, 'There's too much market-rate housing being built, they're trying to push us out of the neighborhood?'" Burnett said. "If I start limiting myself based on people's fears, nothing's going to happen. I wouldn't be able to do anything." Dan Hula, executive director of Lincoln Park Community Services, said the community concerns were unfounded. "We want to be a positive influence on the community," he said. "We want to be something that's beneficial to the community. "People should be asking what's the benefit if we do move in, rather than what's the specific types of social services in that area," Hula added. "We do do some things that some of those other agencies don't." Saying he wanted to be "open here and transparent," Hula said he'd already spoken with Newman and other concerned Old Town residents and had extended an open invitation to come by the Lincoln Park location to "get to see our operations and what we're all about." Twenty-seventh Ward Ald. 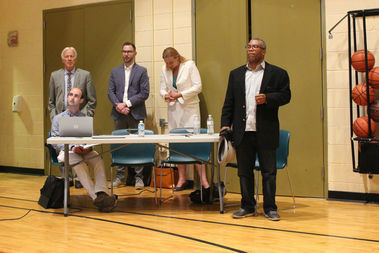 Walter Burnett Jr. (far right) joined representatives of Lincoln Park Community Services at a public meeting on its proposed Old Town outlet earlier this month. 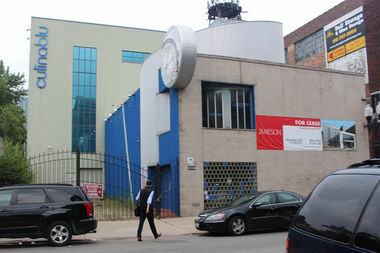 Burnett said the agency had "a stellar reputation" in Lincoln Park, and "folks over there don't complain about it." Burnett said that at the community meeting "most people didn't have a problem with it." He dismissed complaints about openness of the agenda, saying it had been organized by Lincoln Park Community Services and the Old Town Merchants and Residents Association and that they'd been clear about the meeting's purpose. Burnett said at the community meeting that he'd be monitoring the public response, but also made clear where his own personal position was by pointing out that he's on the board of the Chicago Coalition for the Homeless. The general area has proved to be a hotbed of subsidized, mixed-income housing since the Cabrini-Green high-rises were razed, with Burnett recently urging former Cabrini residents to "come back to the community." Newman expressed concerns not that the shelter would bring down the neighborhood, but vice-versa. "We had a person shot this weekend," he said. "We had three people shot in the last [few] months. "It's a rough neighborhood," Newman added. "In the alley behind my house there's often drug deals. There's people shooting up. "Lincoln Park Community Services is a very nice place. But they're working with people who formerly had drug abuse problems or addiction problems or alcoholism or something, and you're putting them in a neighborhood where there are people they're going to interact with who are not going to be a positive influence." Hula said he was unconcerned and that it's not as if the agency's clients didn't already face such temptations just a mile away in Lincoln Park. "I don't think it's something that would bring us down," Hula said. "We believe that neighborhood is a thriving area and a really great community with a lot of great resources. Being so close to public transportation for us is something that's great and also an opportunity for us to be more visible." The project now moves forward against any public opposition to request zoning changes in the City Council and a special-use permit through the Zoning Board of Appeals. Burnett said neighborhood opponents "have the opportunity to go down to the Zoning Board of Appeals and express themselves."